Happy Bloggers Challenge Friday! Thanks to those who played along with last weeks Color Splash Challenge, I enjoyed visiting your blogs! This weeks challenge is a favorite of mine, it's Sketch Challenge time! Use the sketch provided below as your inspiration, feel free to rotate the sketch or swap out the Oval for the shape of your choice. I'm looking forward to seeing your creations! I went rather CAS for this weeks sketch, using the dress form image and a sentiment from Verses Fabulous & Classy Set. All pattern papers are from My Minds Eye The Sweetest Thing BlueBell Collection. The dress is paper pieced with a scrap of MME paper, all edges are sponged with Ranger Gathered Twigs Distress Ink. To embellish I added some Leather Tan Vintage Seam Binding, Zva Creative Crystal Flourishes and Mini Rose Blossoms. 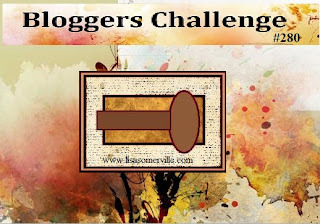 If you'd like to play along with this weeks Bloggers Challenge, please link back to this post on your blog and mention you created your card for the Bloggers Challenge Sketch Challenge. Please add your link using the Link Tool below, your link should be a direct link to your Bloggers Challenge Post, use your name as the Title. Please do not link to cards that were created prior to the challenge date. Entries not linking properly, or backlinked will be removed. If you have the captcha enabled on your blog, please consider turning it off, as it makes it so much easier to leave comments. Beautiful, Lisa! Love the image and sentiment set and the pretty seam binding bow with the flower accents. Very pretty, luv the pping, cute saying. OH Lisa, this is so fun! I love your sentiment! I love the sketch! Cute, cute, cute. Love the way you used this sketch with the dress form and that sentiment.